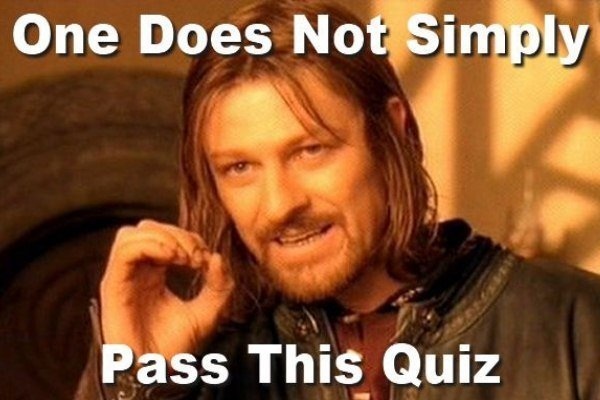 Do-Now: What is the best way to prepare for a Mythology quiz? Work with a partner today on our Quiz Review. Right-Click or CTRL-Click the files below to open them in new tabs. Scroll down for Yahweh and the serpent. Complete today's Classwork with a Partner today. Take notes on any questions that you are unfamiliar with! Study these notes for tomorrow's quiz! Now the serpent was the most cunning of all the animals that Yahweh had made. 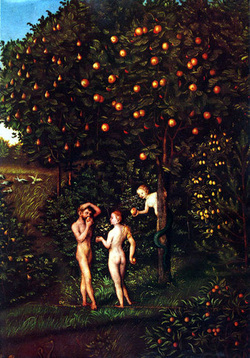 The serpent asked the woman, "Did Yahweh really tell you not to eat from any of the trees in the garden?" The woman answered the serpent: "We may eat of the fruit of the trees in the garden; it is only about the fruit of the tree in the middle of the garden that Yahweh said, 'You shall not eat it or even touch it, lest you die.'" But the serpent said to the woman: "You certainly will not die! No, Yahweh knows well that the moment you eat of it your eyes will be opened and you will be gods like Yahweh who know what is good and what is bad." The woman saw that the tree was good for food, pleasing to the eyes, and desirable for gaining wisdom. So she took some of its fruit and ate it; and she also gave some to her husband, who was with her, and he ate it. 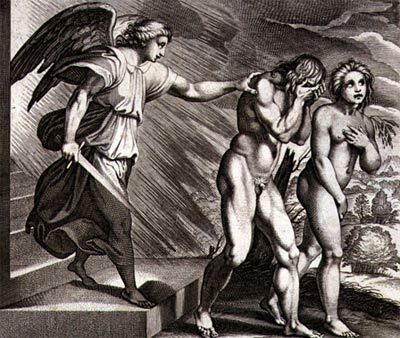 Then the eyes of both of them were opened, and they realized that they were naked; so they sewed fig leaves together and made loincloths for themselves. When they heard the sound of Yahweh moving about in the garden at the breezy time of the day, the man and his wife hid themselves from Yahweh among the trees of the garden. Yahweh then called to the man and asked him, "Where are you?" He answered, "I heard you in the garden; but I was afraid, because I was naked, so I hid myself." Then he asked, "Who told you that you were naked? You must have eaten, then, from the tree of which I had forbidden you to eat!" The man replied, "The woman whom you put here with me--she gave me fruit from the tree, so I ate it." Yahweh then asked the woman, "Why did you do such a thing?" The woman answered, "The serpent tricked me into it, so I ate it." Then Yahweh said to the serpent: "Because you have done this, you shall be banned from all the animals and from all the wild creatures; On your belly shall you crawl, and dirt shall you eat all the days of your life. I will put hatred between you and the woman, and between your offspring and hers; He will strike at your head, while you strike at his heel." To the woman he said: "I will intensify the pains of your childbearing; in pain shall you bring forth children. Yet your desire shall be for your husband, and he shall be your master." To the man he said: "Because you listened to your wife and ate from the tree of which I had forbidden you to eat, "Cursed be the ground because of you! In toil shall you eat its yield all the days of your life. Thorns and thistles shall it bring forth to you, as you eat of the plants of the field. By the sweat of your face shall you get bread to eat, Until you return to the ground, from which you were taken; For you are dust, and to dust you shall return." For the man and his wife Yahweh made leather garments, with which he clothed them. Then Yahweh said: "See! The man has become like one of us, knowing what is good and what is bad! Therefore, he must not be allowed to put out his hand to take fruit from the tree of life also, and thus eat of it and live forever." Yahweh therefore banished him from the garden of Eden, to till the ground from which he had been taken. When he expelled the man, he settled him east of the garden of Eden; and he stationed the cherubim and the fiery revolving sword, to guard the way to the tree of life. List 2 questions that will probably be on tomorrow's quiz.